So here goes. Earlier this week I shared a post showing you five easy tips that you can start using now to stand out on Instagram. One of those tips was to create a visual strategy. 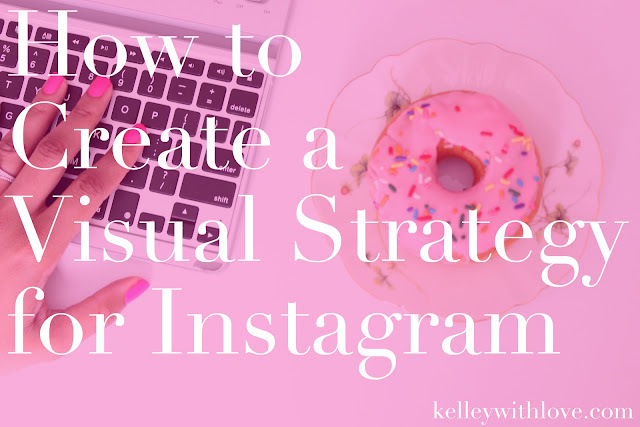 I've gotten a few questions about where to start and what to do when creating a visual strategy, so I thought it was the perfect time to dive a little more into the topic. By now you know I'm a straight shooter and I like to get to the point. So first I wanted to touch on why you want to have a great visual strategy in place. You'll want to have a visual strategy because it will help your brand stand out, it will keep you consistent, and it will make it easier for you to know what types of photos to share. If you go to your favorite brand's Instagram account right now you'll notice that all of their photos are succinct. You'll notice that this automatically draws your attention and the reason why is because the look is cohesive. That's exactly what I want to help you with today. Take your first steps to creating a stunning visual strategy with these action packed tips below. The main component in any strategy is planning. When it comes to a visual strategy, one thing you will want to plan is what types of photos you want to capture. Consider if your photos will capture real life, behind the scenes, styled photos, or a mix. You will also want to plan what colors you plan to implement. This is important because when your photos have similar colors they come together to create a cohesive look. This may also help you decide what types of photos you will want to capture and share. Once you have brainstormed the type of photos you'll share and the color scheme you want to go with, plan some time to take the photos you've planned so that they will be ready to share. Taking time to plan out your photos and the look of your overall profile will pay off as it will allow you to know what you are posting possibly weeks in advance. This will give you time to play with the placement and captions of photos. When writing a caption remember to make sure your caption relates to your photo and make your words visual. An easy trick to remember to help you write visually is to be as descriptive as possible and to rely on making your audience feel an emotion. In essence, you're painting a picture with your words. Even with all the planning and prep work you will do to ensure that your Instagram profile is on point it's good practice to implement a regular review of your overall profile. Review it to ensure flow between photos. Check to see if any of the collective photos do not look or feel like they belong. When your review is done, delete the photos that you feel no longer contribute to the overall look you have decided on. Don't be afraid to go through and delete photos that no longer serve you.